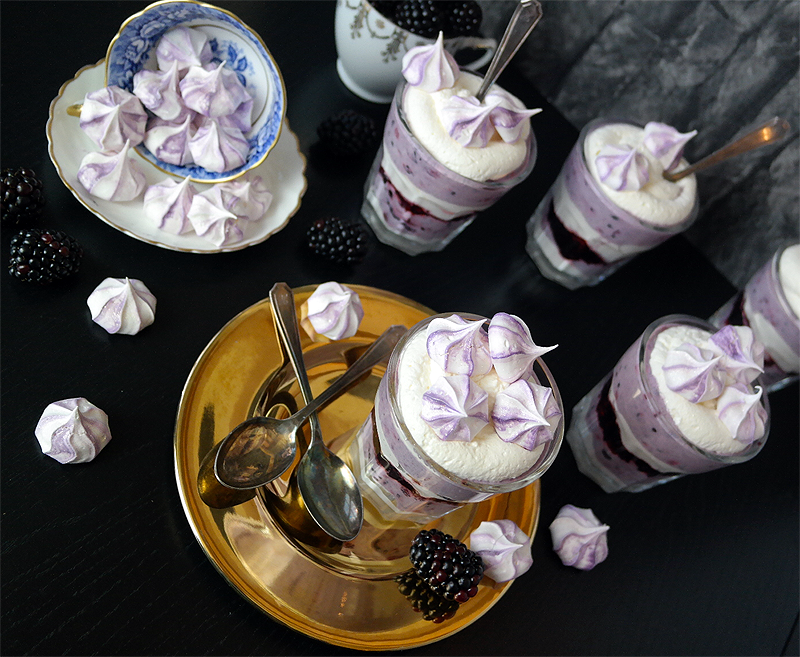 Blackberry Fool with Lavender Meringue Kisses - Sugar, Darling? Seeing as we're at the height of blackberry season here in the UK it wasn't much of a surprise seeing mountains of the beautiful berries at my local market, but I think the heat waves we have been experiencing have resulted in them being extra plumptious, juicy and jewel like and I couldn't resist taking a few punnets home with me. The first punnet I enjoyed while pottering about cleaning my kitchen, dipping each chubby little cluster into a saucer of caster sugar as I used to do with rhubarb when I was small. I pondered over what to do with the second lot, perhaps a crumble or a berry studded crumb cake and it got me thinking. 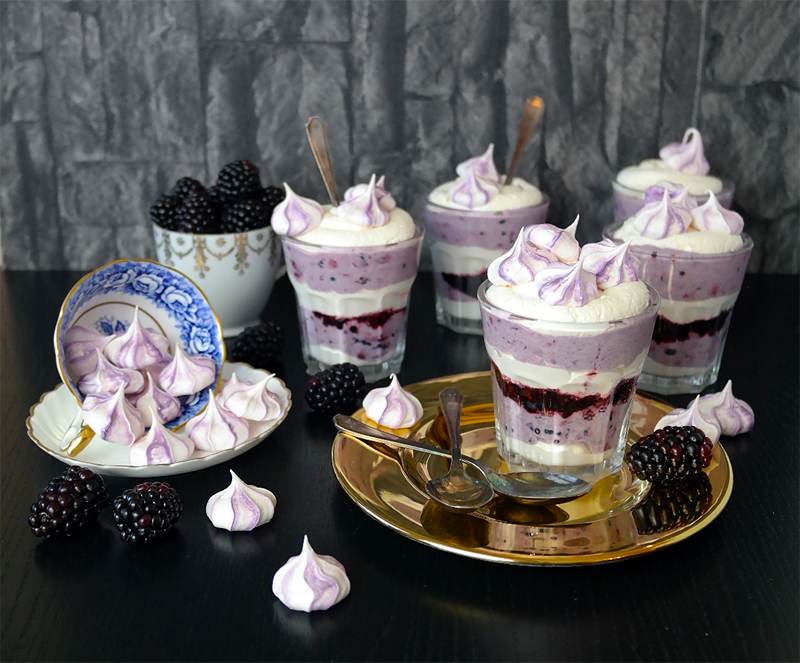 To me blackberries are archetypally British, filling our hedgerows and giving heaps of pleasure to adventuring children and treat seeking adults alike and so I thought it only right to team them with some other very English flavours. I decided on lavender, something that holds real nostalgic value for me and many other children who were lucky enough to grow up surrounded by beautiful countryside. 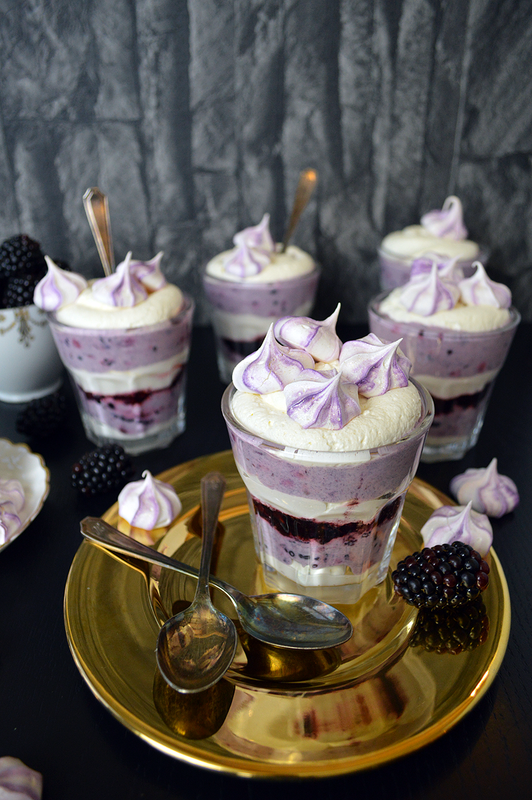 Again I wondered how to tie these two flavours together and decided I didn't want to heat them and lose that fresh fruity and floral flavour and then the idea of a traditional fruit fool drifted to the forefront of my mind. I often get grumpy when I see a fool on a menu and it ends up being just fruit folded through whipped cream as it should traditionally involve stirring the crushed fruit through a creamy custard before being added to the cream. 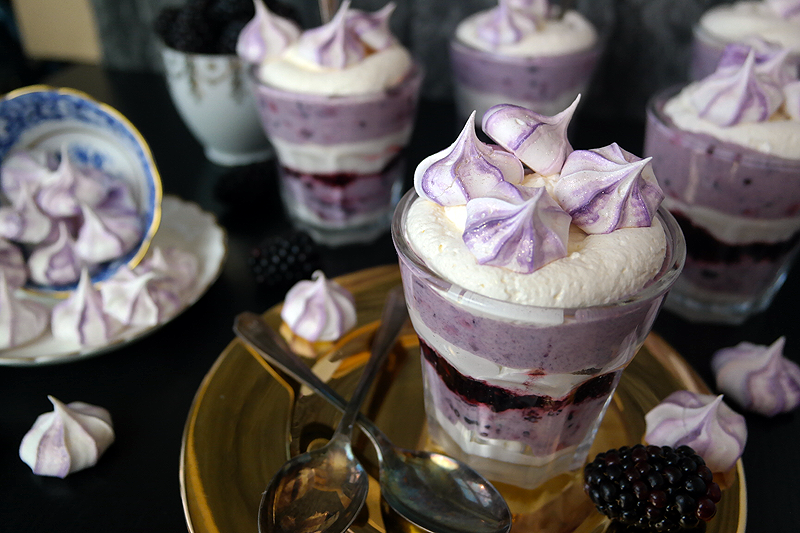 I thought of adding the lavender to the custard but decided that it may just be overpowered by the blackberries and I needed to find a way to let it pack little flavour punches every now and again. Then it hit me - meringue is the perfect partner to dreamy cream and sour fruit and making them into little piped kisses would result in that shot of floral yumminess as often as the eater fancied. Obviously aesthetics also came into play. I knew I wanted to stripe my little meringues with lilac and dust them with edible pearl powder, but I'd never made mini meringues before and wasn't sure if my usual mix would pipe as well at this size. My mind immediately flew to the rainbow sweet creations of The Meringue Girls so I hunted online and decided to try their recipe as can be found here on Bakerella. They worked absolutely perfectly and the method of heating the sugar first really interested me. I don't know that I would do this when making a pavlova or big meringues as I still got the mallowy centre I usually do, but perhaps it added more stability for piping in smaller amounts as the mix did seem a little stiffer than mine. This would be the perfect end to a meal served up in little glasses like I have here or perhaps spooned from a beautiful big vintage dish with the meringue kisses on the side piled into teacups. Naturally if you're not as ridiculous as moi you can just go ahead and spoon it into normal bowls, but where's the fun in that? Preheat your oven to 200C / 400F. Weigh your egg whites and then weigh out double this amount of caster sugar. Pour the sugar evenly into a deep baking tray roughly lined with baking parchment and pop into the oven for 5-10 minutes until it is hot and starting to caramelise at the edges. While the sugar is in the oven start whisking your egg whites, slowly at first to develop bubbles and then taking it up to high speed until you have very stiff peaks - you'll be at this stage when you can tip the bowl upside down over your head and nothings falls out! When your at this stage start pouring in your hot sugar a spoon at a time, letting the mix get back up to stiff peaks before adding the next spoonful. Along with the final spoon of sugar add in your lavender flavouring (and colouring if you don't want them striped) and then let it all mix on high speed for 5-7 more minutes until you have a thick, glossy meringue mix. To test if it's ready take a little and rub it between two fingers - there should be no graininess as the sugar should have dissolved fully and it should feel sticky and create a firm peak. Turn your oven temperature down to 100C / 200F. Now you want to pipe your kisses. If you want to stripe yours pull a piping bag inside out and paint on four or five thick stripes of colouring before turning it carefully back the right way and popping in a piping tip if you're using one. Now spoon in your meringue and give it a gentle smoosh to remove any air pockets. This video from the girls themselves shows you just how to do this if you need a little extra help. Pipe your little meringue kisses onto trays lined with baking parchment. You don't need to worry about leaving huge gaps as they won't spread but I wouldn't crowd them together too much. Depending on the size of your piping your meringues will need a different amount of cooking time, so pop your meringue studded trays into the oven and let them bake for 30-40 minutes until they are crisp but not browned. Allow the kisses to cool completely before serving alongside the fool. Crush the blackberries with a fork and stir them through the custard. Whip the cream with the sugar and vanilla to soft peaks. Spoon the two mixures into the serving dish of your choice, alternating the layers so you get a pretty striped effect. I also added a few more crushed blackberries between the layers for another pop of purple. 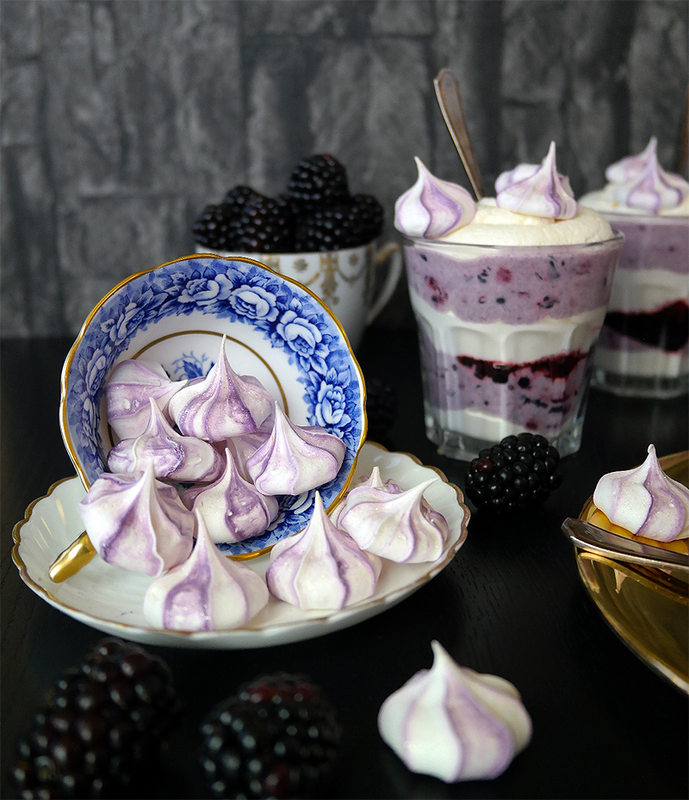 Sprinkle over some meringue kisses or serve them alongside and enjoy the taste of an English Autumn!